The Apple iPad Air 2019 is a very interesting 10.5-inch tablet. While a lot of features are almost identical to the iPad Pro, it is a lot cheaper. Prices start at 499 US Dollars. Well, that is still expensive, and some premium features are missing. So, should you get it? That’s what we’ll discuss my iPad Air 2019 review. iPad Air 2019 looks like a typical iPad. With 10.5-inches it is a bit bigger than the iPad Air 2 and as big as the first 10.5-inch iPad Pro. Compared to that one, the design is almost identical. It is almost the exact same body. It is very thin with just 6.1mm and weighs 456g. As usual, we’re getting a full metal body and it is very premium feeling. You can get it in Silver, Space Grey, and Gold. As you can see, Apple is using its old design here and it does not look as modern as the new 11-inch iPad Pro does. The bezels around the screen are wider –, especially at the top and bottom. We don’t get Face ID. Instead, there’s the typical home button with a built-in Touch ID fingerprint scanner. That one works fast and precise. On its sides, we get a power button, volume controls, and even a standard headphone jack. I think every tablet should have one. I’m a bit disappointed by the Lightning connector of the iPad Air 2019. Apple should just switch to USB C completely. Next to the Lightning port are two speakers. While those are stereo speakers, you won’t hear any real stereo separation when watching movies because both speakers are on the same side. That’s not ideal because most Android tablets that start at 300 Dollars do offer four speakers. With that being said, the sound quality out of those two speakers is excellent. And yes, better than what we get with most Android tablet. Especially when considering that this is a tablet, the bass is very good and the sound is clear. There’s a 7-megapixel front-facing camera and the one on the back has a resolution of 8 megapixels. Most tablets don’t have great cameras. And while the quality is not as good as the one from a premium smartphone, photos and videos look good for a tablet. However, you cannot record 4K videos. Let’s get to the display of the iPad Air 3. It has a diagonal of 10.5-inches and a very high resolution of 2224 x 1668 pixels. That means it has a pixel density of 264ppi and that is very high for this size. Everything looks sharp. It is an IPS screen with wide viewing angles. And it is fully laminated – but that’s what we’re used to from the iPad Air predecessor already. Because of that and its anti-reflective coating, you won’t see reflections as easily. Oh, and it is very bright with 500 Nits. Contrast and color reproduction are excellent. And it does support Apple’s True Tone technology. That means it is replicating the color temperature according to its surroundings. Most of the time that looks great, but you should be careful with it when editing photos. Overall, I think the iPad Air 2019 has an excellent screen. It is very bright, looks pretty and I’m sure everybody will be happy with it. However, compared to the Pro, it is missing Apple’s ProMotion technology with a refresh rate of 120Hz. It is very hard to see a difference though. Inside the iPad Air 3 runs the same Apple A12 Bionic processor we’ve seen in the iPad Mini 5 and iPhone XS already. Additionally, we get 3GB of RAM and you can choose between 64GB and 256GB of storage. There’s no microSD card slot. If you want, you can get 4G LTE though. As you can see in my benchmark comparison, the performance is very good. Yes, it’s not as powerful as the A12X of the iPad Pro but much faster than all Android tablets. I should also note that it is faster than the simple iPad and the old 10.5-inch iPad Pro. Well, so we get the same chipset as the iPhone XS has. And that means that I don’t have much to say about its performance. Obviously, iOS itself and pretty much all apps run very smooth. Those include Safari, YouTube, Lightroom, and LumaFusion. I often use the 11-inch iPad Pro and compared to that one, I can’t see any real difference on the iPad Air. Sure, it’s faster in benchmarks, but in real life, it looks the same. Affinity Photo seems to run identical, for example. And it performs well with multitasking too. I think you will see differences once both tablets are older, and apps get more demanding. But certainly not now. The gaming performance is excellent too. Demanding games like Fortnite and PUBG Mobile run with highest settings very smooth. And, I mentioned it in my iPad Mini review already: PUBG Mobile looks much more detailed than on the Huawei MediaPad M5 8 which is one of the fastest Android tablets. Overall, I think the performance of the iPad Air 2019 is outstanding. But still, technically the iPad Pro is much faster. It’s just hard to notice a difference right now but that will probably change over time. Let’s check out some accessories. You can use the iPad Air with the original Apple Pencil and the same keyboard cover Apple sold for the 10.5-inch Pro. While Apple Pencil 2 is not compatible, you can use the Logitech Crayon. Well, we’ve been familiar with the Apple Pencil for many years now and it works exactly as it does on other iPads. The stylus can recognize how hard you press and if you’re holding it at an angle. You can use that to draw shading. It is a good pen to draw with or to write down handwritten notes. I think the stylus doubles as a great mouse replacement too. I like to use it with apps like Affinity Photo or LumaFusion. The Apple Pencil is charged using the Lightning connector of the iPad Air. That’s how you connect it when using it the first time. I mentioned it in my other iPad reviews already: With this pen, it feels like you’re writing with plastic on glass. I mean, that’s what you’re doing. However, the pens from Samsung and Microsoft feel more like paper because they’ve got softer tips. To get a similar feeling, you have to get a special kind of screen protector for the iPad Air. Alright, let’s get to its keyboard, the Smart Keyboard Folio. I said it already: It is the same keyboard we’ve seen with earlier Pro tablets and this one works with the Air too. On the side of the tablet is a magnetic connector. That’s how you connect the keyboard without using Bluetooth. It also means you don’t have to charge it separately. I think it’s a bit disappointing that the keyboard cover protects the screen but not the back. Apple changed it with the new ones. I also think that the folding mechanism is not ideal and not well thought out. You can use the tablet in one angle only. The keyboard itself is fine. Because of the 10.5-inch screen, it is a bit smaller than from what you’re probably used to from desktop or notebook keyboards. You can’t press the keys down much either, but that’s what we’re used to from Apple anyways. And you can get used to that. I’ve typed a lot with the 11-inch iPad Pro keyboard in the last couple of months and the keyboard itself is pretty much identical to the iPad Air’s one. The keyboard is very good if you’re looking for something small and portable. However, if you want to replace a real working machine with the Air, you probably should get a real big keyboard that can sit on your desk. As we are sadly used to by Apple, official accessories can be very pricey. While the Apple Pencil costs 99 US Dollars, you have to pay 159 US Dollars for the keyboard. Apple is shipping the iPad Air 2019 with iOS 12. Based on the past, it’ll get updates much longer than any Android tablet will get. That’s very good. I’m sure most of you are familiar with iOS and I don’t have that much to say about it. If you haven’t used an iPad in the last couple of years, it’s important to know that iOS supports real multitasking now. You can open two apps side by side and even open a third one on top of that. The drag and drop feature works great too. And you can navigate it using gestures. In the case of the iPad Air, you obviously can use the home button as well. The typical restrictions of iOS have not changed though. While there’s a files app now, you don’t get any real access to the files system. You can connect accessories like SD cards readers but you can import photos and videos only. And that’s the case if the camera manufacture saves those in the folders Apple prefers. You can’t import videos recorded with a Sony camera, for example. And if you’ve saved PDFs, word documents, or audio files on the SD card, you can’t access them either. However, overall, I think the software of the iPad Air is great. Everything runs smooth, multitasking works great, and you can get way more apps that are optimized for tablets. Among those can be really professional ones like Affinity Photo followed by real Photoshop soon. In my battery test, the iPad Air 3 got a runtime of 12 hours and 30 minutes. For this, I’m always looping the same HD video at medium brightness. As you can see in my battery comparison, it does not last as long as the iPad Pro. But still, it is a very good result. Alright, let’s get to the end of my iPad Air 2019 review. My final verdict is very positive overall. Even when considering its price of 499 US Dollars, I think the display and especially its performance are excellent. It is faster than all Android tablets. Other aspects like battery life, metal body, and fingerprint scanner are great too. At the same time, iOS is a stable operating system with a lot of apps optimized for tablets. On the negative side, I wish Apple would stop using the old Lightning port. It’s also disappointing to see that both speakers are located on just one side. The sound quality is great but most Android tablets for around 300 Dollars have four of them. If you’re looking for an even better tablet, you should check out the iPad Pro. That one offers a bit better screen, is much faster in Benchmarks, offers four speakers, USB C, and better cameras. Its keyboard cover does protect the back and it supports the Apple Pencil 2. You have to pay a lot more though: Prices start at 799 US Dollars. A cheaper iPad is the simple 2018 iPad. Its 9.7-inch screen is a bit smaller and it’s weaker overall. The screen is not laminated, so you do see an air gap underneath the touchscreen. While the performance is weaker too, I think it’s still good enough for most. It’s not as premium feeling as the Air or Pro and that’s mainly due to the not laminated screen. However, it’s much cheaper with prices starting at just 299 Dollars. If you prefer Android tablets, you could check out the Samsung Galaxy Tab S4. With that one, you get a very pretty Super AMOLED screen and it is the fastest Android tablet currently available. The iPad Air is faster though. Still, we get four speakers, USB C, and the very good S Pen is included at no extra costs. Especially when considering that, it’s much cheaper with prices starting at around 500 US Dollars. 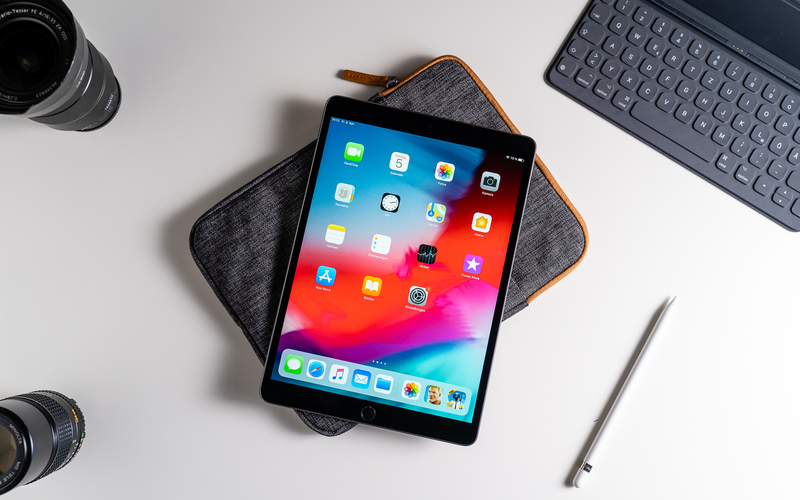 Apple iPad Air 2019 Review:The Apple iPad Air 2019 is one of the best tablets you can get right now. It offers a pretty screen, very powerful hardware, and a premium build quality. Other aspects like Touch ID, Apple Pencil support, optional keyboard, and battery life are good too. At the same time, it will be kept up to date longer than most competitors.